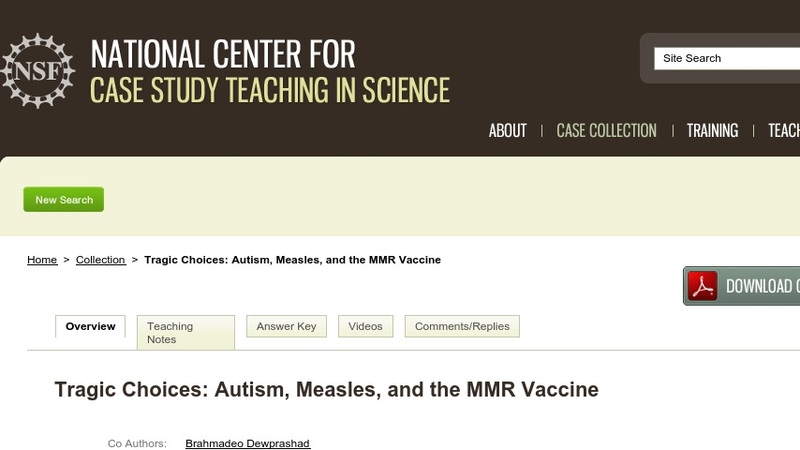 This case explores the purported connection between vaccines in general, and the MMR vaccine specifically, and autism. Students examine results from the 1998 Lancet article that ignited and still fuels the anti-vaccine movement; students are then asked to design a better study to test the causal relationship between the vaccine and the disorder. This case was developed to help science-phobic undergraduates understand the distinctions between good science, bad science, and pseudoscience. Most importantly, the case shows how "thinking scientifically" is a learnable skill that can empower students to make intelligent choices for themselves and their families. As such, the case would be suitable for any course introducing students to the nature of science, good (vs. not-so-good) experimental designs, appropriate interpretations of data, science as a self-correcting process, etc. Opportunities exist to expand the case to focus on issues related to research ethics, responsible journalism, and the interface between science, society, and the law.